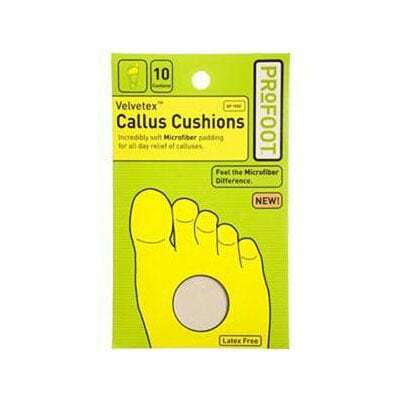 PROFOOT Care Velvetex Callus Cushions 10/pk is an excellent choice to help with your foot health concerns. PROFOOT makes a complete product line of items aimed to help heal and encourage proper foot care. The Velvetex Callus Cushions designed with a unique, breathable material that is softer and more durable than ordinary moleskin. It performs better under pressure and moves with your foot to help reduce friction with its microfiber texture thus further protecting your sore spots. The Velvetex cushion is ideal for all types of calluses, hard skin or tender spots and provides you all-day relief from calluses. Idea for all types of calluses, hard skin or tender spots. Contains 10 Velvetix Callus Cushion.